Hey! 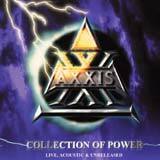 Axxis, one of my favourite bands released a cool collection of songs reuniting some live, acoustics and unreleased tracks (2). The package is really cool and the choice for the live tracks is quite good (Shadowman, Flashback Radio, Kings Made Of Steel & Little War). Axxis already having a live record preferred having some unreleased title and I agree with this choice (although I would have loved to get a “Never Say Never” live version on this CD instead of “Kings Made Of Steel” from the first album). Like you’ll be able to hear for yourself, Bernhard voice is a good on live show as it is on the albums. He’s simply amazing. As for the sound of the live records, it’s okay but nowadays it’s possible to get a more powerful sound I think. There’s acoustic tracks and new songs as well (Julia being both new and acoustic). Julia is a nice ballad, again Bernhard’s voice is the key of this song… Heaven In Black acoustic version is not that good, but I must tell you that I’m no fan of acoustic. The album will finish on a huge surprise, a track called Moonlight, oh dear, how come this song wasn’t released before ??? It’s amongst Axxis best songs. There’s no info on when the song’s been made but I’d say it must have been around the third album recordings cause it have this special “Matter Of Survival” sound. This album is really destined for fans of the band, for those who don’t know Axxis yet (shame on you), you’d better try their last full length album “Back To The Kingdom” (see April’s reviews or Axxis in the bands section) or their first album “Kingdom Of The Night”. I love this release and the packaging rocks (nice colors !!! ), definitely a must have for all fans around the world. Speaking of fans, you can also find some others cool unreleased songs from Axxis on mp3.com , a special MP3.com album with 6 unreleased tracks + 1 acoustic (Kings Made Of Steel) called “Pure & Rough” that will please any Axxis fan I’m sure. You did not vote yet. Be the first one to post a reply!